from a multiplex of tightness that pains but holds together. lengths they putter away to, the costs. First appearing in Poetry Magazine and then as a chapbook published by Factory Hollow Press, the poem’s over-abundance proved too much for some readers who admitted to quitting Hymn to Life halfway in. The failure of those to complete the poem was in part due to its repetitiousness, which created an expectation of predictability. 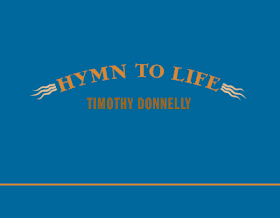 As a result, some readers believed they didn’t have to complete the poem to appreciate its meaning and it’s somewhat understandable: at times Hymn to Life has the vibe of a conceptual poem. And yet it’s not and by not reading the entire poem, its full meaning cannot entirely be apprehended. On the other hand, for those readers who never completed Hymn to Life, the poem’s meaning was certainly felt. Dissuaded by the poem’s breadth, and since its biome didn’t reflect the modality of customized experience we’ve been habituated to prefer, some readers were exposed by their failure to simply focus on something so time-consuming and not of their choosing. The set-up to Hymn to Life puts the speaker in the position of constantly looking backwards and as that backward-looking process evolves, the poem gets smaller and smaller as it nears completion. Inescapably, so does the future. Hymn to Life is a poem about approaching extinction by participating in it, but not only as a species – human and otherwise – but as someone with the imaginative faculty to create (and destroy) and this is, it seems to me, one of Hymn to Life’s central challenges to the reader: how does one see life through to the end? In The Logic of Sensation, Gilles Deleuze’s book on Frances Bacon, he writes “In art, and in painting as in music, it is not a matter of reproducing or inventing forms, but of capturing forces.” Donnelly’s work has always been interested in seizing potency and in Hymn to Life he’s still at it, but seizing that potency by combing the terrain of years gone by. With vigor, the poet obsessively accrues information from the past, filling the poem with mostly extinct or endangered animals and plant-life, but also with trinkets of history and micro-asides. What makes Donnelly’s work in general so uniquely his own is his fidelity to articulating an inner surplus. In the case of Hymn to Life, that surplus is teased out from within the past, and the result is a brilliant one: Donnelly has created a gorgeous, but melancholy memory project. Located in the great previous, we watch as the speaker exhaustively harvests various intersections of data, penetrating facts into other facts, each occurring at different points in time. Reading Hymn to Life gives one the odd sensation of the forward mobility of reading itself, a progressive movement, but in this case one that is always a constituent part of the same erstwhile. And like the extinct or vanishing or tinkered-with biosphere Donnelly describes, the speaker gets closer – one stanza after another – to joining them. The overall effect is unsettling because the multiplicity of Hymn to Life gives the poem a linguistic élan vital, but so relentless is its total expression that relief feels inevitable. When there was time to put away the dishes, they were gone. When Donnelly describes seeing people rummaging through his recycling and watches them close the bags with “so much care”, the resulting feeling he experiences is one of devastation. Rather than some form of hyperbolic pity for the scavengers, the emotion is evidence of the speaker’s total immersion in the moment, hence finding himself not reporting the scavengers, but being within the scavengers and also the very movements they enact when they carefully “shut the bags back up”: true sympathy. Following this, the speaker reproduces the Bergsonian process of sympathy by experiencing next the sensations of humility as he bathes his two-year old daughter, realizing that if he were to die she would never remember him. It’s something every parent contemplates, and therefore not particularly remarkable, but in the context of the poem’s temporal concerns it hits the perfect note: why is it important to remember? Or more broadly: does it matter how we remember? The last line of the poem is equally intriguing in that it recalls a moment earlier in the poem where Donnelly confesses that he promised his wife he’d do the dishes before the babysitter arrives. However, he’s too busy working on the poem titled "Hymn to Life" and he confesses “I won’t be a person of my word tonight.” But one wonders, as the speaker finally finds time to do the dishes and discovers they’re already done, if that’s all he is: a word’s blind faith in a tomorrow. When his intention to wash the dishes finally moves towards its fulfillment, the dishes are gone: and so is the poem, so is the poet, and so is the reader. Perhaps what makes Hymn to Life one of the most important long poems written in the last several years, aside from its spectacular humanity, is its cultural relevancy. While many will (reasonably) want to put the poem squarely into the category of ecopoetics because of its reliance on natural history, and one cannot deny the poem’s ecological preoccupation, the poem is more philosophical at heart; a critique of the nature of time and data in modernity. In his book 24/7: Late Capitalism and the End of Sleep, Jonathan Crary characterizes our life in a digitized capitalism as one long “duration without breaks, defined by a principle of continuous functioning.” The dynamism of Hymn to Life reflects this model of living, and its consequences, through its unremitting flow. It’s no wonder only three of the sixty stanzas in Hymn to Life end on a period and why some readers were resistant to engage the poem: since its excessive energies couldn’t be customized, why bother? A hymn is a song of praise and this poem is too, which makes it refreshing in a critical climate that is routinely negative about life. Daily experience might be daunting in a morally impoverished world, but it doesn’t mean, Donnelly seems to be arguing, we accept it and live in a society where the most sanctified act we make in a given day is posting on Facebook a link to an article about the latest injustice. Within praise is the inevitably of loss, and Hymn to Life always holds these two feelings suspended before the reader at once. Its atmosphere of sadness and hope is the outcome of knowing that when we have nothing left to praise, when we reserve the exclusive right to know only what we want to know, then the incentive to preserve vanishes. By transcribing the past – and having the unprecedented ability to do so – Donnelly shows how it can possibly nurture (rather than inconvenience) the present and that without memory our compassion for all that lives becomes endangered.